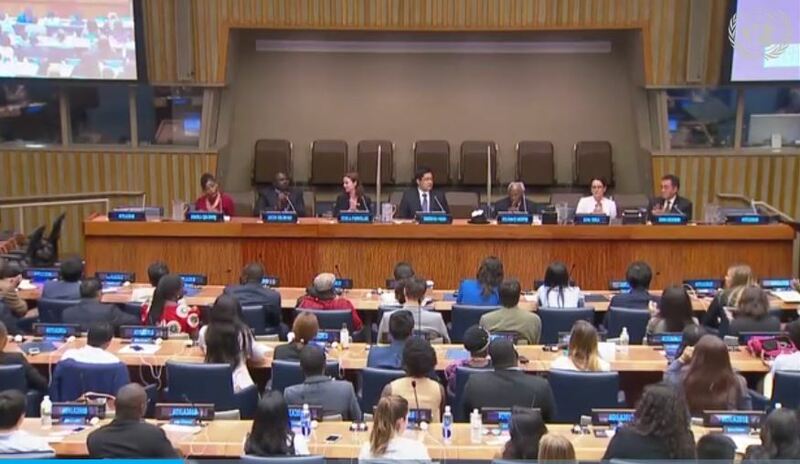 Shinwon Moon delivered the following speech at the United Nations headquarters in New York City during the annual International Young Leaders Assembly (IYLA) on August 14, 2018. Shinwon Moon is a special adviser of the Global Peace Foundation, a co-convener of the IYLA, and eldest son of Dr. Hyun Jin Preston Moon. He is a graduate of the United States Military Academy (West Point). After his graduation, he was commissioned as a second lieutenant of the United State Army. Soon after, he was deployed to Afghanistan, where he earned a bronze star medal and the combat action badge. In his address to the delegates of the Global Youth Summit, he used his experiences in serving in areas of conflict to illustrate the importance of moral and innovative leadership. And the power of the vision of One Family Under God. I just want to start by saying that none of those accomplishments would have been possible without the hard work and sacrifice of the soldiers under my command so first and foremost I believe that they deserve the lion’s share of the accolades. I just want to begin by thanking your excellences, honored guests, IYLA participants, and I would especially like to thank the permanent mission of Uganda who is hosting us today, my fellow co-conveners who have joined Global Peace Foundation in this partnership and Global Young Leaders Academy and World Assembly of Youth as well as the UN missions of Ireland, Kenya, Mongolia, Nepal, Paraguay, Philippines, Republic of Korea, and the United Kingdom. So I would like to begin by asking a question: What is moral and innovative leadership and how does it apply to young leaders? Let us examine the terms “moral” and “innovative” sequentially. At its core, the moral component of leadership must promote a greater good that benefits not only the individual, but the larger society, nation, and world. It must be guided by a common vision and must be rooted in irrevocable universal principles and values that have the breadth and depth to encompass the entire diversity of the human family. Throughout the twentieth century, from the bloody trenches of the mar in World War I to the harrowing beaches of Normandy in World War II to the daring landing at Incheon in Korea, the United States has fought nobly against tyranny and injustice for the greater good of the world. In every instance, young soldiers, sailors, and airmen would leave their loved ones to fight on distant shores for people they had never met. Many thousands would never return home to their loved ones having made the ultimate sacrifice in the pursuit of peace. The valiant sacrifices of these men and women would define the term “moral leadership” in a century racked by war and bloodshed. Now, in the twenty-first century, I was in middle school when two hijacked planes crashed into the World Trade Center on September 11, 2001. As a young boy growing up in Westchester County, New York, the human toll from the horrific act of terror hit particularly close to home. Several of my schoolmates’ parents lost their lives in the attack. I, like many others of my generation, answered the call to military service. I entered West Point as a new cadet in 2007 and graduated in 2011 as a second lieutenant in the United States Army. A year later, in 2012, at the age of 23, I found myself serving as the commanding officer of a platoon of thirty-five soldiers on a C1-30 military plane headed to Afghanistan. In the noble tradition of veterans before me, I would perform my duty and fought on behalf on my country. Now I would like to go into the innovative aspect of leadership. The innovative aspect of leadership harnesses mankind’s natural, creative need to advance the human condition. In every culture, extraordinary men and women have propelled humanity forward in the fields of philosophy, ethics, science, athletics, and the arts by freely exercising their God-given talents even to the point of challenging existing paradigms. This, by surmounting the religious, societal, and legal constraints of their time, such innovators brought greater advances and freedoms to the modern world. In Afghanistan, my men and I found ourselves in the heart of Kandahar, along the northern banks of the Arghandab River, in an area nicknamed “the birthplace of the Taliban.” Our mission was to defend Kapsangsar, a small combat outpost deep in the heart of Taliban territory with the eventual goal of transferring that property, that outpost, to our Afghan national army counterparts. For nine months, we withstood mortar fire, survived complex ambushes, and overcame the ever-present IED threat that dogged our every step. I had to sleep with a pistol under my pillow in the event that our small outpost was infiltrated by Taliban fighters masquerading as members of the Afghan national army. I personally witnessed many friends who lost their lives due to the so-called “green on blue” attacks where the Taliban would wear the uniforms of slain Afghan national army soldiers and, disguised as soldiers and our partners, they would inflict their horrible toll on us. Amidst the trials and tribulations of the war, I never forgot my roots as a young leader growing up within GPF. In high schools, I spent my summers leading small groups in overseas service projects in Mongolia, Thailand, Japan, and the Philippines, and also South Korea. These early formative experiences proved to be crucial for what came next. While living with and interacting with the local populace, I identified a serious problem. Every time my men and I would enter a village in our daily foot patrol, we’d be mobbed by children begging us for “kalam,” the Pashtun [the local language] word for “pen.” A few months into deployment I realized that the root cause for this was there were no schools in the entire district. Children who were too young to work the fields were by in large left to their own devices. Without the structure and the stability, not to mention the education, that a good school provides, children often ended up as collateral damage in the ongoing guerrilla war between coalition forces than the Taliban. Moreover, these children without education would grow up and follow in the footsteps of their fathers and older brothers by joining in the ranks of the Taliban. Even though this was not part of our mission, I resolved to build a coeducational school in Sangsar, the so-called birthplace of the Taliban. Over the next few months, I drew upon my experience working with NGOs to organize donation drives to acquire enough school supplies to start a school. I convinced my Afghan army national counterparts to become a sponsor so that they too have an ownership stake in the education of the young people of that district. I received permission from my commanding officers to utilize the American-owned building, which we used to hold meetings with the tribal elders, to use that, to convert that building into a schoolhouse. At my interpreter’s recommendation, I recruited one of his friends from the University of Kandahar to serve as a schoolteacher. Lastly, my men and I traveled down IED-infested roads to meet with each village elder in the district to receive their blessing for the endeavor. This last part would prove to be my biggest hurdle. The elders were in favor of allowing boys to attend the school but were vehemently opposed to allowing girls to attend. After months and months of negotiation and by the grace of God, the elders finally relented and allowed girls to attend alongside boys. In the final few months of my deployment, I had the privilege of opening Sangsar School to the public. Passing notebooks and pens to eager children, the sons and daughters of the Taliban, as they embarked on their educational journey, was one of the proudest moments of my life. And after emerging from the crucible of war, I have internalized a core conviction that all people, regardless of race, religion, ethnicity, or socio-economic background are all members of one human family. And we are all one family because we all share a common origin. We all share a common origin within the creator God. This core conviction can be encapsulated in a single statement: One family under God. This simple but powerful vision statement captures the essence of what an idealistic young leader from all generations have sought to become, which [are] agents of positive change in the world. One of its greatest strengths is its applicability to cross all fields of human endeavor. While I implemented this vision within a narrow military context, subsequent years of military service have led me to a single conclusion: you cannot achieve lasting peace with military might alone. Instead, it will take energetic, committed young leaders from all over the world and from all occupations and all backgrounds to come together in a conference like this here today to lay the seeds for stronger, more lasting peace. And after emerging from the crucible of war, I have internalized a core conviction that all people, regardless of race, religion, ethnicity, or socio-economic background are all members of one human family. As we look to the future, I would like to direct your attention to an issue that has captivated the international community and is integral to my identity as a young man of Korean descent. My father, and the Chairman of the Global Peace Foundation, articulated the vision of a Korean Dream, a movement to reunify the divided Korean peninsula. Unlike the failed attempts of the past, the Korean Dream is a Korea-led movement where her people draw upon the [Korean founding vision] Hongik Ingan ideal to seize the reins of their own destiny. The Hongik Ingan ideal transcends mere politics. It captures the long-dormant national aspiration to live for the greater benefit of all mankind. Inspired by Korea’s illustrious shared history and extended family tradition, the Korean Dream once realized can unleash the floodgates of Korean innovation and creativity for a brighter, more prosperous future. March 1st next year is the centenary of the Korean independence movement against Japanese colonial rule. It was launched in 1919 with peaceful mass demonstrations where the Korean declaration of independence was proclaimed. The centenary will be a moment for rededication to the ideals and aspirations of the champions of Korean independence. Further, the centenary will serve as a clarion call to galvanize all Korean people to include the diaspora community all around the world in common cause towards a shared future that realizes the historic aspirations for a unified Korea that not only benefits its civilization but also benefits the entire world. Our burning desire to create a world free of conflict, corruption, poverty, and disease brought us together and as we go forth into the world today, let us all act on our convictions and realize the greatest dream of all: to build a world of peace and prosperity through the vision of One Family Under God. The Global Peace Convention will be held in Seoul next March focused on achieving the original goals of the independence movement and promoting the One Korea Global Campaign. I invite you all as young leaders to join us in Seoul next year and to support this global campaign. Before I conclude, I would like to thank all of you for coming here today and taking on the mantle of becoming the moral and innovative leaders in our world. In closing, I would like to share the immortal words of Mahatma Gandhi, “Be the change you want to see in the world.” This simple yet profound statement exhorts us to take on the mantle of moral and innovative leadership. Our burning desire to create a world free of conflict, corruption, poverty, and disease brought us together and as we go forth into the world today, let us all act on our convictions and realize the greatest dream of all: to build a world of peace and prosperity through the vision of One Family Under God.